I am heading off for Convention in TWO WEEKS! Yippee! All of the conventions that I've attended have been amazing, but I'm sure this one will be over-the-top because it's Stampin' Up! 's 25th Anniversary!! But before I can go, I have a LOT of things to get done, so I'd better quit dawdling. Today's card was created by a member of my downline - Diane Kipp. It's so bright and cheerful, it makes me smile to just look at it! 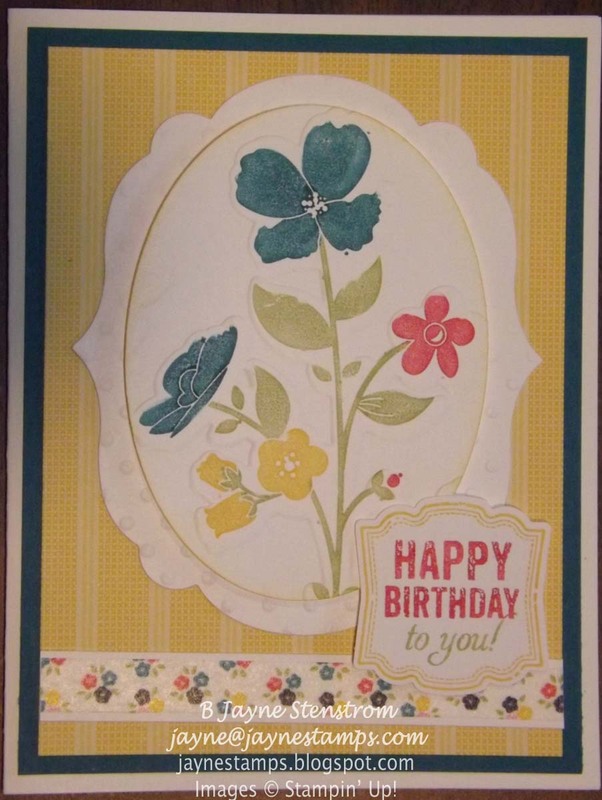 This card uses the Label Love stamp set that I showed in my last post, along with the Wildflower Meadow stamp and coordinating Embossing Folder, the Gingham Garden DSP and coordinating Washi Tape, and markers in Daffodil Delight, Island Indigo, Melon Mambo, and Pear Pizzazz (Stampin' Up! makes it so easy to coordinate the colors using their papers, inks, markers, and other accessories). Diane also used the Ovals Collection Framelits, the Labels Collection Framelits, and the Perfect Polka Dots Embossing Folder. Don't you just love the results?